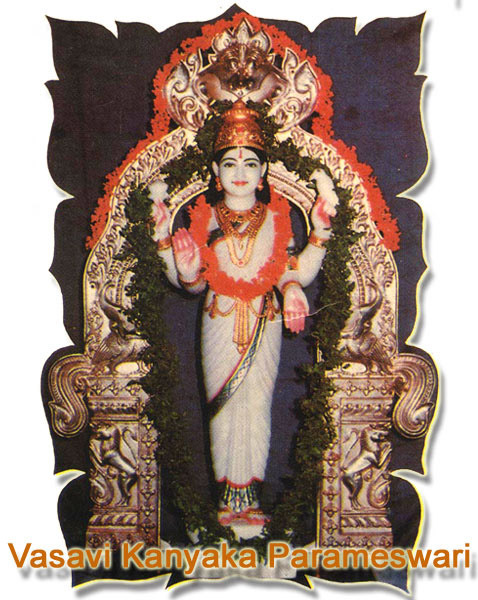 Penugonda is the birth place of Goddess Sri Vasavi Kannika Parameshwari .Sri Vasavi Kannika Parameshwari Temple is situated in Penugonda ,a town in West Godavari district of Andhra Pradesh.This Penugonda Kshetram is considered as the "Kasi of Vysyas" and is a holy place for vysyas. The Birth place of Vasavi Matha. The holy Sri Vasavi Kanyaka Parameswari temple which finds mention in various ancient religious texts. According to a legend, Vasavi Kanyaka Paratneswariwas was famous for her beauty. The holy temple enshrining the triple deities- Sri Nagareswaraswamy, Mother Kanyakaparameswari and Mahishasuramardini. The temple is built in strict accordance with vastu sastra and so possessing sturdy prakars, tall gopuras , spacious courtyards, several minishrines, vast garbagrihas, grand mukhamandapas etc. it faces east and a tall tower surmounting over the broad mahadwara beckons the visitors with its beautiful sculptural pieces adoring it from top to bottom and on all four sides too. In front of it lies a vast courtyard with several buildings housing the office room, choultry and quarters for the staff. In the second Prakara, there are many mandapams installed with adorable deities, like Vinayaka, Bali, Navagrahas, besides the exquisitely made colorful statues of Mother Kanyakaparameswari standing in fire -pit with parents by her side. The garbha griha of Nagareswaraswamy is quite spacious, and its spick and span together with the elevated vedh for the lingam in the center is masterly planned and tastefully executed. The imposing ling installed on a broad, high pedestial adorned with colorful garlands and the triple lines studded with diamonds is so captivating that the devotees raise their hands in veneration the moment it gleams into their sight. And feel transported to Kailas for a while. Its size and sheen are its plus points. The other two garbha grihas frankling this housing Mahishasuramardhini and Vasavamba are grand, and the icons beautified with dazzling jewels and colorful outfit mesmerises the adorers. A single darsan leaves unforgettable impression on the minds of the devotees and beckons repeated visits on and on. 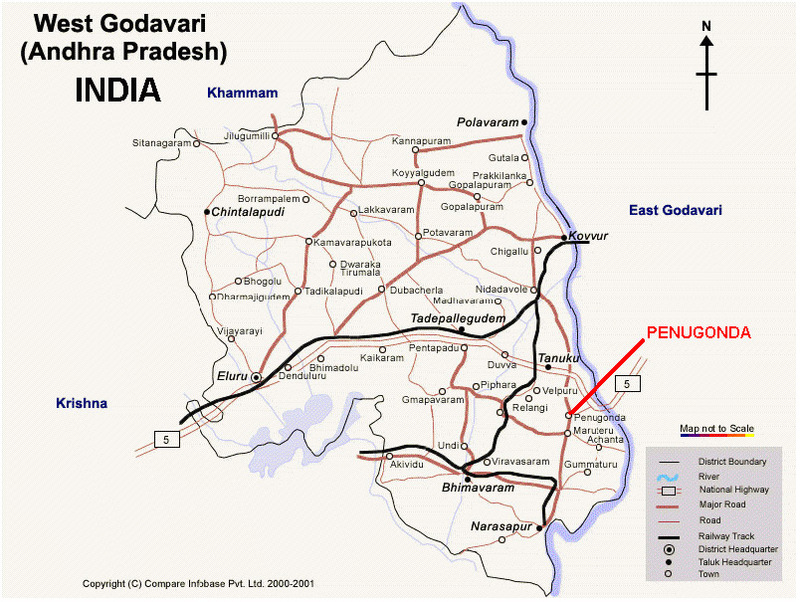 The Nearest Airport is Vijayawada, 130 kms from Penugonda Town. Buses that ply to Narasapur from Hyderabad, Vijayawada, Tirupathi, Vizag, Rajamundhri, Nidadavole. Information extracted from (Source): Pamplets by Penugonda Vysyas, Sri Kanyaka Puranam. Celextel's Online Spiritual Store - Offers Books, CDs, Crystal Figurines & Malas, Enamel Photos, Incense Sticks, Japa Malas, Lockets, Maha Merus, Navaratna Malas, Parad Items, Poonools, Rudraksha Beads & Malas, Shaligram Shilas, Tulsi Malas, Yantras and other Indian Religious Items.